We’ve performed side-by-side comparisons of the Galaxy S5 next to other Android-powered devices (HTC One M8, OnePlus One, Nexus 5, etc. ), but this week we’re going to take a step in a different direction by comparing Samsung’s flagship smartphone to the new BlackBerry Classic. The BlackBerry Classic was officially launched in New York, Singapore and Frankfurt, Germany last month. The Classic maintains true to the QWERTY-keyboard style that made BlackBerry such a popular device, but it also introduces several technological improvements. “We listened closely to our customers’ feedback to ensure we are delivering the technologies to power them through their day – and that feedback led directly to the development of BlackBerry Classic,” said John Chen, Executive Chairman and CEO at BlackBerry. Let’s first talk about the operating systems used in the Galaxy S5 and BlackBerry Classic. As you may already know, the Galaxy S5 runs Android 4.4.4 KitKat, which is currently being updated to Android 5.0 Lollipop. The BlackBerry Classic, on the other hand, runs BlackBerry 10, which has significantly fewer apps and features. There’s a notable difference in size between the two devices, as well. The Galaxy S5 features a bold 5.1-inch display, whereas the BlackBerry Classic is much smaller, measuring just 3.5 inches in diameter. If you’re the type of person who enjoys watching videos, playing games, or even viewing photos on your device, you’ll probably want to stick to Samsung’s flagship smartphone for this reason alone. In terms of processing power, the BlackBerry Classic is on par with the Galaxy S5. Samsung opted to use the Qualcomm Snapdragon 801 processor in its flagship smartphone, while BlackBerry went with the Qualcomm Snapdragon S4. The BlackBerry Classic has 16GB storage, while the Galaxy S5 has 32GB. Both devices have 2GB RAM. 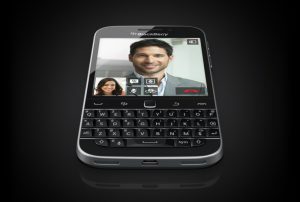 But the one area in which the BlackBerry shines is its use of a physical keypad. Some people find it earlier to type long messages on a physical keypad such as this as opposed to a virtual keypad. This feature has encouraged many consumers to buy BlackBerry devices in the past, and it’s unlikely this trend will stop with the BlackBerry Classic. Of course, there are others who prefer to use a virtual keypad, as it allows for swipe texting. The BlackBerry Classic is priced at $449. The Galaxy S5 is priced at $499. Would you choose the Samsung Galaxy S5 or BlackBerry Classic? Let us know in the comments section below!